Since focusing on machine sewing for the past year, I’ve often missed having a handwork project for the backyard lounge chair or for in front of the TV. At the beginning of the month, I decided to have another go at cross stitch using the same piece of 28 count linen I bought late last year. Browsing on Pinterest, I’ve noticed the popularity of seasonal cross stitch and Christmas motifs across national boundaries. Besides English language charts, French and Russian (Cyrillic alphabet) are the two languages I have seen the most. Motifs I see again and again are houses, flowers, birds, rabbits, sheep, letters of the alphabet, words and phrases. 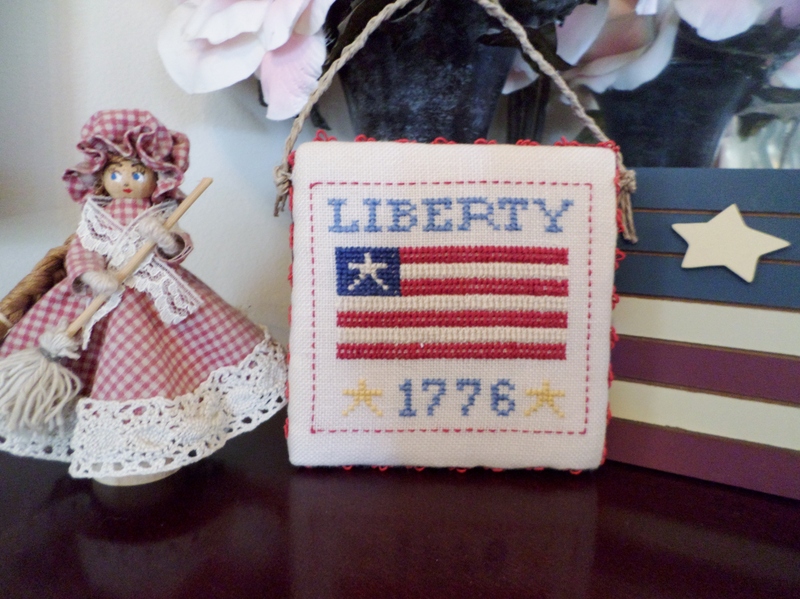 Judging by cross stitch blogs, prim style, patriotic themes, and samplers that are replicas from early America are favorites of American stitchers. Do Americans love patriotic themes for quilting and stitching more than other countries do? Is it because of the colors of the red, white, and blue flag, the artistic possibilities of the stars and the stripes? Or is it because of the recent founding of our nation, what it stands for, and the fact that most of our ancestors journeyed across the ocean to come to this New Land? I think it’s all of those, plus the early summer seasonal association with patriotic decorations due to Memorial Day falling near the end of May, Flag Day on June 14th, and then Independence Day on the fourth of July. 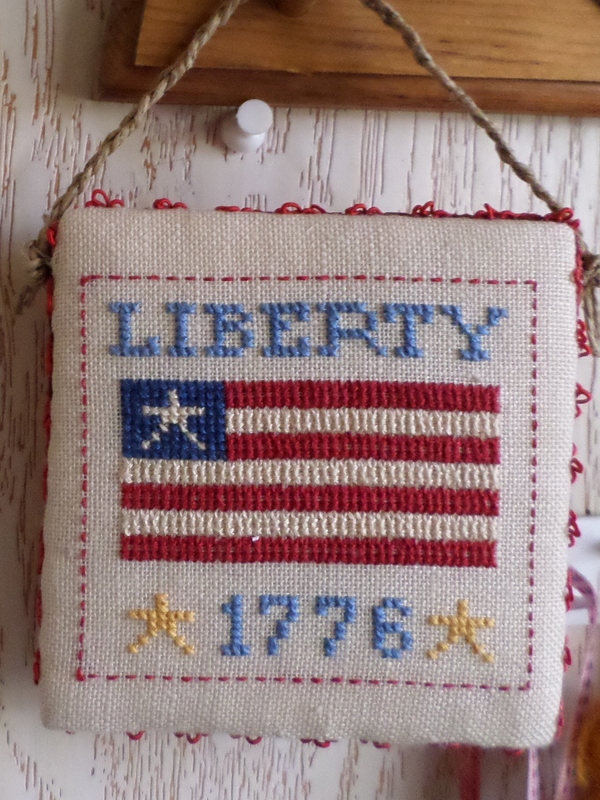 I enjoyed stitching this free America download from Glory Bee. There was less counting required in this design, and I was able to see the stitches using the magnifier I had bought previously. 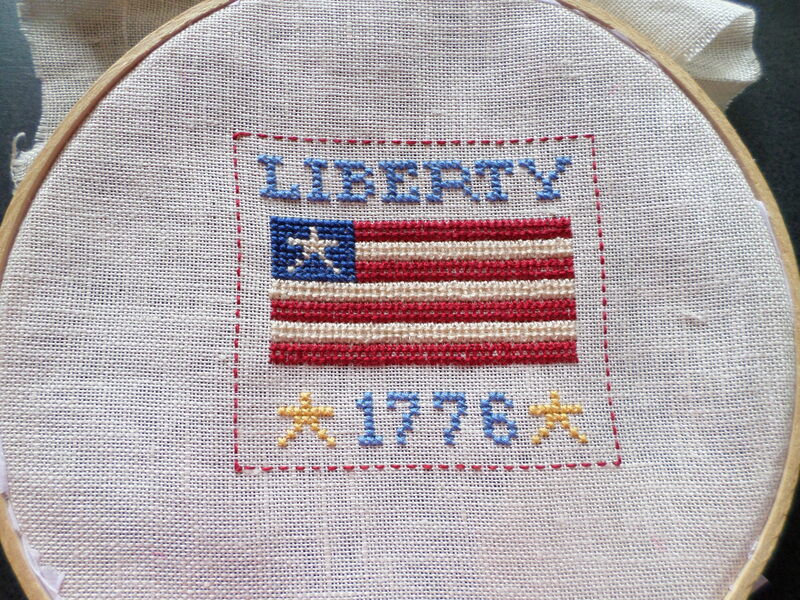 The changes I made to the design were to change the word “America” to “liberty” and change the border to a simple running stitch. After storing the completed piece in the drawer for a few weeks, I researched finishing techniques and found gluing, sewing, pinning, and taping to be the options. I cut 2 pieces of foam board and two pieces of cotton batting 4 x 4 inches. I laced the finished piece on one piece of foam board using carpet and button thread, then laced the backing fabric onto the other piece of foam board, added an embroidered name and date panel, sewed the two halves together, glued on the ribbon trim, and braided hemp cord for hanging. I had trouble cutting the board, and didn’t get it even, which is why my finished piece is a little uneven. Here is the finished result next to the colonial clothespin doll I made several years back. 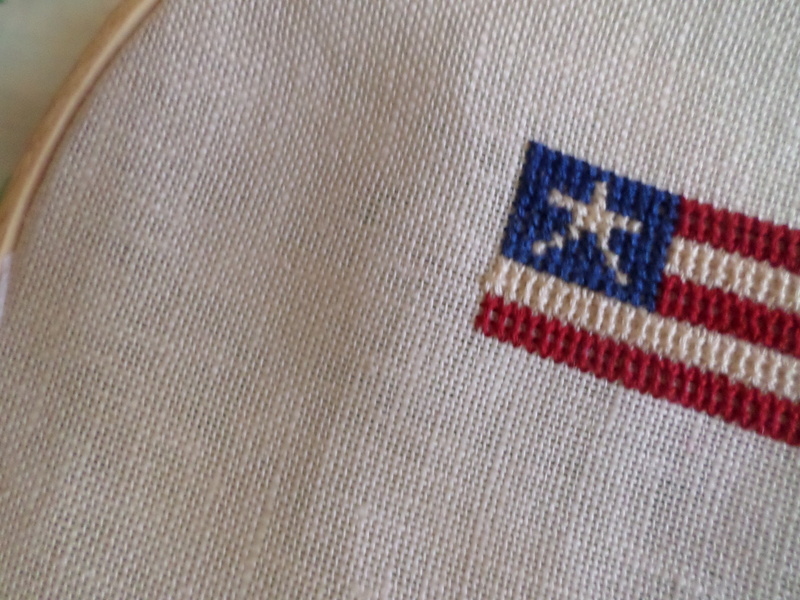 This entry was posted in Embroidery and tagged cross stitch finishing techniques, patriotic american cross stitch on July 29, 2014 by Stitch It Again. There are times when I want to watch something other than dramas, comedies, news, or movies, and be both entertained and learn things related to sewing. These are the free videos and programs I’ve found and enjoyed. Let’s start with YouTube, which is a vast source of instructional videos. Professor Pincushion is a channel offering over 200 professional quality video tutorials with information and projects. A new video is released weekly. There is even an android app which makes the videos easier to find. Her voice and style is pleasant and upbeat, and the videos are clear and informative. Amongst my favorites are “How to Create Patterns from Existing Clothing- Intermediate” and ” How to Sew a Hemstitch Using a Wing Needle”. The latter is an example of a technique I wouldn’t have searched for, because I didn’t even know about it! I’ve since found out this is a technique used in heirloom sewing. Fashion Sewing Blog TV is a channel run by Colleen G Lea. When I was looking up the different types of elastic waistlines I watched “Sewing an Elastic Waistband with No Casing”. I also recently watched “Forming Pintucks” about the 3 types of tucks. The Crafty Gemini features Vanessa’s videos on sewing, gardening, and cooking. I like her “Beginning Sewing Projects” videos. Sewing With Nancy originates from Wisconsin Public Television. Nancy Zieman’s show features quilting as well as other sewing topics. If you’re American, you have probably watched Project Runway. But have you watched Project Runway Australia or Project Runway Canada? Project Runway has aired thirteen seasons, as well as all-star editions, on two different cable networks. I was able to find seasons 1-9 available on YouTube. The four seasons of Project Runway Australia are available on YouTube. When I starting watching Season 1 I had to look up the definition of “daggy” as it’s a word that came up repeatedly on the show. Daggy is defined as not stylish, out of fashion, not trendy, not cool. Daggy can also be more literally defined as not neat or unclean having to do with dirty wool matted around a sheep’s behind. Besides learning new slang words, you will also find lots more fun and camaraderie than fighting among the contestants on this Australian version. Project Runway Canada aired for 2 seasons and starred model Iman as the host. She is a formidable presence and was tough on the designers. Only two seasons were produced of Project Catwalk, the British version of Project Runway, which featured model and actress Elizabeth Hurley. Interestingly, Project Runway only lasted a few seasons in every country that aired its own version, but in the U.S. it goes on and on. The Great British Sewing Bee was a big sensation among sewing bloggers when it first aired. Tilly from the popular blog Tilly and the Buttons was a contestant. I originally watched it on You Tube, but it has since been taken down. The 4 episodes are still available as of this writing through the link I provided. I missed watching the second season, and I can’t currently find any viable links. Craftsy has a few free sewing classes, and I’d recommend their paid classes as well. The provided links for videos are current as of July 2014, but shows may only be available for a limited time from a listed source. Do you have any video favorites or know of any TV shows I have missed? This entry was posted in Sewing and tagged project runway, sewing videos, sewing with nancy, YouTube sewing links on July 11, 2014 by Stitch It Again.